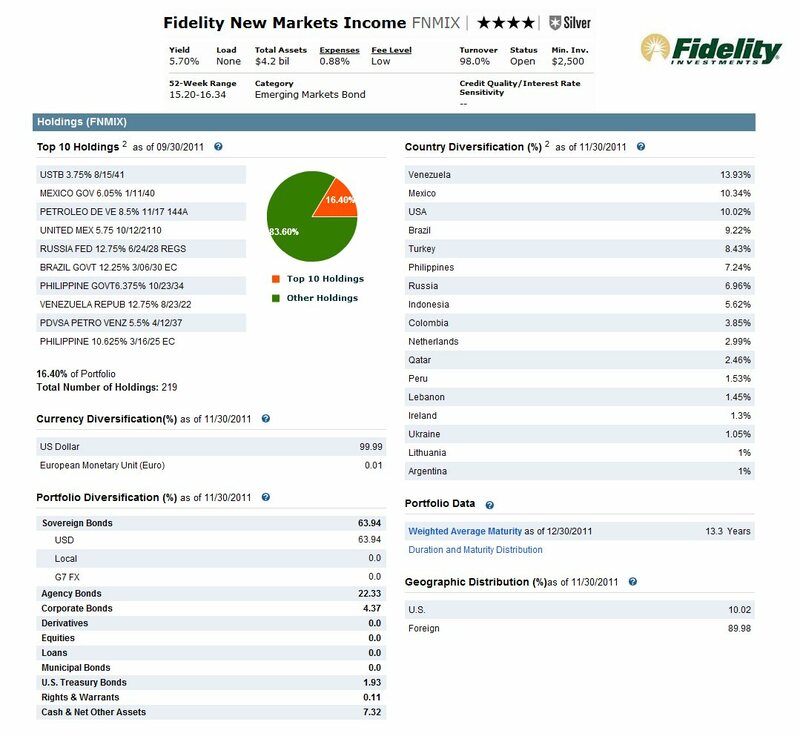 Fidelity New Markets Income fund (FNMIX) is one of the best performing funds of 2011. This Fidelity fund invest in emerging markets bonds. This Fidelity New Markets Income fund seeks to provide high current income as its primary objective. It also has a secondary objective such as capital appreciation. This fixed income fund invests majority of assets (>80%) in debt securities of issuers in emerging markets. This best bond fund may invest in other types of securities. It is considered as non-diversified fund. Since its inception in 1993, this Fidelity taxable bond fund has provided consistent return. The fund’s manager, John H. Carlson, has been managing this fund since 1995. Carlson is the vice president and portfolio manager with Fidelity Investments. He is also named as the 2011 fixed income fund manager of the year by Morningstar. The fund’s yield is 5.70%. This top emerging markets bond fund also has 0.88% expense ratio. There is no sales load and no 12b1 fee. The annual holding turnover rate is 98%. This FNMIX fund’s also has a weighted average maturity of 13.3 years. Rated with 4 star ratings by Morningstar, this top fixed income fund has returned 22.45% over the past 3 year, 8.29% over the past 5 year, and 12.06% over the past decade. The fund is rated rated with Silver Rating for its future performance. The best return occurred in 2009 with 44.56% and the worst occurred in 1998 with -22.38%. Investor can buy this mutual fund from 69 brokerages such as: Met Life Resources MFSP Alliance List, Ameritas NTF, Federated TrustConnect, TIAA-CREF Brokerage Services, JPMorgan INVEST, etc. According to the fund’s prospectus, investing in this top bond fund involves investment risks such as stock market risk, interest rate changes risk, issuer specific risk, etc. As of December 2011, the top 8 countries in this fund include Venezuela (13.93%), Mexico (10.34%), USA (10.02%), Brazil (9.22%), Turkey (8.43%), Philippines (7.24%), Russia (6.96%), and Indonesia (5.62%). The currency diversifications are as follow: 99.99% in US Dollar, and 0.01% in Euro (European Monetary Unit). The fund assets are diversified as follows: 63.94% in Sovereign bonds, 22.33% in Agency Bonds, 7.32% in Cash, 4.37% in Corporate Bonds, 1.93% in US Treasury bonds, and 0.11% in Rights & Warrants. 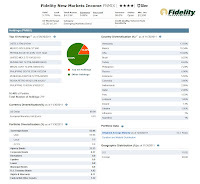 This Fidelity New Markets Income Fund (FNMIX) is part of Kiplinger's 25 best mutual funds.